(Oct. 13, 2017 –Los Angeles, CA) In anticipation of the worldwide release of Sony Pictures Animation’s animated motion picture The Star, in theaters November 17, 2017, Epic Records and Sony Pictures Animation will release The Star: Original Motion Picture Soundtrack in stores and online October 27, 2017. The album, featuring new music from Mariah Carey, is available for pre-order HERE. A look inside the The Star soundtrack can be seen HERE. The first track for instant grat is “Life is Good” by A Great Big World. Listen to the song HERE. Following that, on October 17th, Fifth Harmony will release “Can You See”. In addition, Kirk Franklin, Kelsea Ballerini, Zara Larsson, Casting Crowns, Yolanda Adams and more serve up new tracks recorded specifically for The Star. Each artist got into the spirit with show-stopping and standout performances. Get ready for The Star to shine on stereos and big screens everywhere this year. 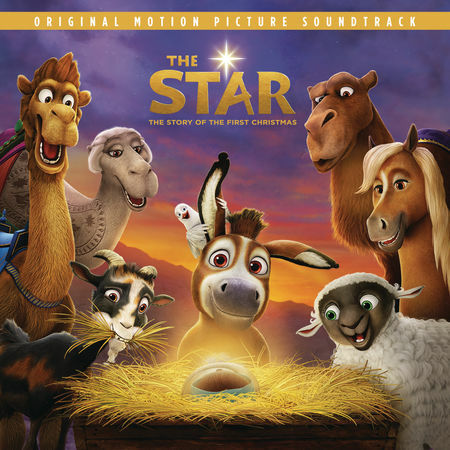 In Sony Pictures Animation’s The Star, a small but brave donkey named Bo yearns for a life beyond his daily grind at the village mill. One day he finds the courage to break free, and finally goes on the adventure of his dreams. On his journey, he teams up with Ruth, a loveable sheep who has lost her flock and Dave, a dove with lofty aspirations. Along with three wisecracking camels and some eccentric stable animals, Bo and his new friends follow the Star and become unlikely heroes in the greatest story ever told – the first Christmas. The film stars the voices of Steven Yeun, Gina Rodriguez, Zachary Levi, Keegan-Michael Key, Kelly Clarkson, Anthony Anderson, Aidy Bryant, Ving Rhames, Gabriel Iglesias, Patricia Heaton, Kristin Chenoweth, Christopher Plummer, and Tracy Morgan and Tyler Perry and Oprah Winfrey. Directed by Timothy Reckart, the screenplay is by Carlos Kotkin, with a story by Simon Moore and Carlos Kotkin. The film is executive produced by DeVon Franklin, Brian Henson, and Lisa Henson, and produced by Jennifer Magee-Cook.